This last weekend I was sick with a horrible cold. I missed work and did not leave my bed, I felt absolutely terrible. I spent my time reading The Hound of the Baskervilles by Sir Arthur Conan Doyle and The Canterbury Tales by Geoffrey Chaucer, although I would have rather been at work. The only positive side for being sick is free gifts! Feeling bad for me, my mother bought me this cute little cup and saucer! I wish there was a teapot to match, oh well. 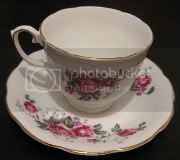 The cup and plate are adorable and are sitting in my china cabinet at the moment.